This is the kids’ mountain bike that is touted as the only one with outstanding safety integrated into its design and performance. 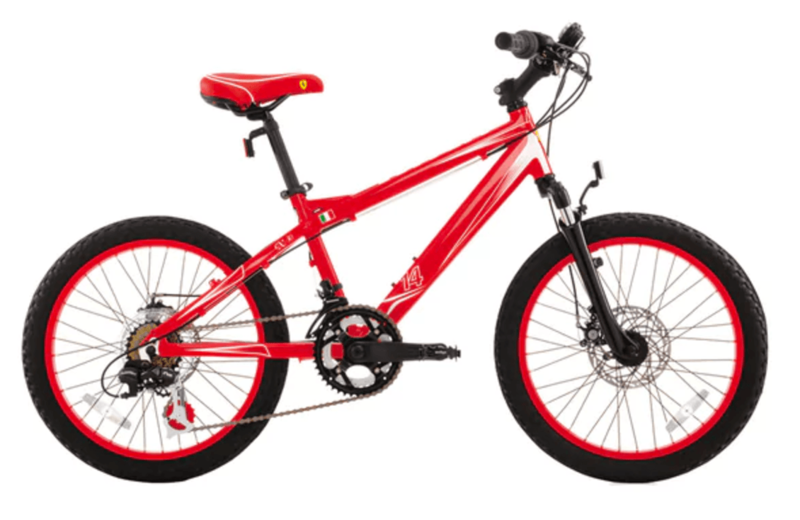 The Ferrari CX-30 (af) 20" children's bike is made to be a lightweight mountain bike with hi-tech aluminum frames, an aluminum stem, MTB styled handlebars and suntour alloy forks. Designed with both rear and front brakes, it is definitely a safe kid’s bike that comes with a range of speeds going up to 12. This makes it bike for exploration and efficiency. But what are its features, pros and cons? Are you a Geek at heart? At Dadtography.com, we are geek dads at heart. We love video games and comic book heroes, Star Wars and Star Trek, technology, toys, 3-D printers and makers, gadgets and all sorts of other geeky stuff. We're looking for other geek dads to contribute to Dadtography.com. We'd love to be your "geek dad blog". Write about any geeky topics you like. Our website is your platform to express your true inner geek. If you've always wanted to be a geek dad blogger, without the hassle of setting up and running your own website, this is your chance to let your geek flag fly! Thanks for your interest in blogging as a "geek dad" with Dadtography.com! We’ll be in touch soon. The Ferrari CX-30 is made with tires that perform optimally on both urban and sub urban surfaces, thanks to its low embossed tread tires. It was made for boys aged between 6 and 8 years old, as its Velo soft handgrips are specifically ideal for smaller hands. The manufacturer also included optimum safety features to enhance the performance of the bike. These are the front V-shaped brakes and the rear disc brakes that are powerful enough although very soft in their braking levers. This ensures that little strength can achieve effective braking to avoid accidents and enhance maneuvering. The bike is made up of hi-tech aluminum frames and Fe-C alloy fork that not only ensure it is durable enough but also lightweight for easier pedaling by kids. It also comes with great accessories including a chain protector, training wheels and a rear mudguard, all coming at an all-inclusive price averaging right around $499. The price is decent for a durable and sturdy bike of this type - and to say you own a Ferrari! Most people who have bought this bike noted that the lack of varying colors was a limitation of choice even though the inspiring theme was the Ferrari racing teams. However, it is considered a great design for kids who enjoy pedaling. The price may be a bit steep for some, especially considering it's the size of bike that children will likely grow out of eventually. Overall, it's not a bad bike and one that will let you brag that you used to own a Ferrari "when you were a kid"!